A staggering 18 under par for his last six rounds at the Qualifying School, Kearney is bubbling with confidence and believes he has the game to join his former Ireland team mates Rory McIlroy and Shane Lowry on the European Tour next season. "I’ve lost touch with Rory over the last couple of years but I’m still in contact with Shane," he said after posting eagle, four birdies and three bogeys. 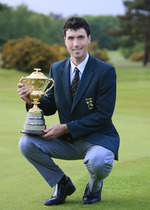 “Loads of Irish players are coming out of the amateur game and doing well so that gives you more confidence. There is no reason why my game is not good enough to be out there with them. “I am not surprising myself with the way I am playing. I was confident and relaxed all the way through the second stage and I am still confident. “I could have gone deep the last couple of rounds and it could have been three or four better today. Hopefully we can post a couple of low ones in the last two rounds and finish the job." Kearney holed confidence boosting par putts of four and eight feet at the first and second before racking up birdies and the third, sixth, 10th and 11th to roar up the leaderboard. A three putt bogey at the 13th set him back but he jumped straight into the top 10 by rifling a 200 yard four iron to six feet at the 15th to set up a stunning eagle before a missed green at the 16th and a poor drive at the last cost him bogeys. Early morning frost delayed proceedings by 75 minutes, leaving two groups with holes to finish this morning before the 72 hole cut will decide the top 70 and ties who will contest the last two rounds. With England’s Simon Khan leading by three shots on 20 under par, the guillotine will fall at three under par, which means that Ireland’s Gary Murphy and Simon Thornton (with a three under par back nine) survive by a shot after rounds of 74 and 69 respectively on the Stadium Course. But Clandeboye’s Jonathan Caldwell, Glasson’s Colm Moriarty and St Margaret’s teaching professional John Kelly all missed the boat after varying woes yesterday. Caldwell’s exit was tragic. Needing only a par five at the Tour Course's 18th to progress, he drove out of bounds for the second time in nine holes, eventually found the outting surface in five and three putted for a triple bogey eight and a 72 that left him three shots from safety on level par. “The bad shots have cost me a lot,” said Caldwell, who mixed an eagle and 19 birdies with four doubles, a triple and a quadruple bogey. Moriarty putted poorly for a 76 on the Stadium Course to finish five shots outside the mark on two over par. He used irons for safety off several tees and failed to find fairways and couldn’t hole putts for par when he needed them most. As a result, the 30-year old from Athlone had four bogeys and no birdies and faces yet another season on the Challenge Tour. Teaching pro Kelly knows that he must compete regularly at a higher level if he is to become a tour player. The problem is that he is 38 and will struggled to get starts on the Challenge Tour next season. Playing for pride and a higher profile that could be useful when seeking invitations, he began birdie-birdie, then chipped in for an eagle at the 12th but played the rest in one over par for a three under 67 and a six over par total. “I learned a lot,” said Kelly. “Today was the worst 67 you have ever seen. It could have been 59, I holed nothing. The standard of the players hoping to make the tour is now so high that former Ryder Cup player Andrew Coltart fears that great players are slipping through the net for want of opportunities. South Africa’s Anton Haig shot an eight under 62 on the Tour Course to move into the top 30 on seven under. He went out in 28 thanks to two eagles, four birdies and a bogey but could only manage one under on the homeward nine. 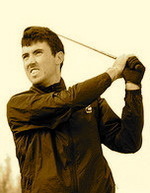 Several high profile players missed the cut, including Ryder Cup player Joakim Haeggman and young English starlet Oliver Fisher.